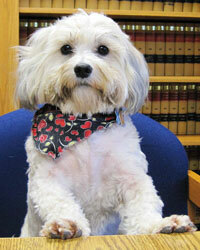 Tana has recently joined our legal assistant team. She is Michael Kittell’s primary legal assistant, as well as Lois Albright’s primary legal assistant on Guardianships and Conservatorships. Tana was born and raised in Nehalem, Oregon, is a graduate of Neah-Kah-Nie High School and has a B.S. degree in Criminal Justice from Western Oregon University in 2017. You may contact Tana at tana@albrightkittell.com or by calling 503.842.6633. Buddy is our canine comfort support staff. Buddy is a schichon and is hypoallergenic. Buddy has not met a client he did not like. Buddy loves to attend client conferences and is bound by attorney-client confidentiality to not disclose your confidences to any other dogs or persons. Buddy may only be contacted in person.